In his lifetime, Charles Darwin was roundly mocked for suggesting that humans were descended from apes, and even in our own day, the teaching of evolution remains controversial. But in the century and a half since the publication of On the Origin of Species, our increasingly sophisticated understanding of genetics has borne out Darwin's theory: humans share 99% of their genes with chimps (and many even with grapes!). 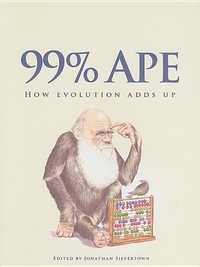 99% Ape offers an accessible, straightforward introduction to evolution, beginning with Darwin's discoveries and continuing through the latest genetic discoveries. Edited by Jonathan Silvertown, the volume brings together experts in a variety of fields pertinent to evolution, from paleobiology to planetary science, comparative anatomy to zoology, and even--for a discussion of legal battles surrounding the teaching of evolution--law. Interwoven with these varied accounts of evolution and its impact are vignettes from Darwin's life that illustrate the continuity of thought that links Darwin's work to today's cutting-edge research. Beautifully illustrated, 99% Ape is a perfect companion to the upcoming celebration of Darwin's bicentennial and a bracing reminder of the important role evolution still has to play in our understanding of our origins--and our possible futures.